In this updated version of the traditional Easter hot cross bun, chunks of dark chocolate and tart dried cherries make these even more irresistible. 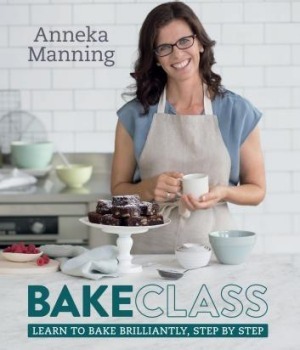 Bakeclass, by Anneka Manning. Murdoch Books. $45. 1. Put the bread, flour, sugar, yeast, mixed spice, cinnamon and salt in a large bowl and mix to combine. Stir through the dried cherries and currants. 2. Heat the milk and butter in a small saucepan over medium heat until the butter has just melted and the milk is lukewarm. Whisk one of the eggs with the vanilla and add to the milk mixture. Whisk to combine. Add to the dry ingredients and use a wooden spoon and then your hands to mix to a soft dough. 3. Turn onto a lightly floured bench top. Knead for eight to 10 minutes or until smooth and elastic. Lightly grease a clean large bowl with a little butter, add the dough and turn to coat the dough. Cover with plastic wrap and set aside in a warm, draught-free place for an hour or until doubled in size. 4. Line a large baking tray with baking paper. Punch the centre of the dough down with your fist. Turn onto a lightly floured bench top. Knead for two to three minutes or until smooth. Knead in the chocolate. Divide the dough into 12 equal portions. Roll each portion into a ball and place on the tray, allowing room for spreading. Cover with a damp tea towel and set aside in a warm, draught-free place for 30 minutes or until almost doubled in size. 5. Preheat the oven to 180°C or 160°C fan-forced. Meanwhile, make the flour paste. Combine the flour and water in a bowl and beat with a wooden spoon until smooth. Spoon into a small plastic bag. 6. Whisk the remaining egg and brush the tops of the buns with it. Snip a small hole in the corner of the plastic bag containing the flour paste and pipe crosses on the buns. 7. Bake in the preheated oven for 25 minutes or until the buns are cooked and sound hollow when tapped on the base. 8. Meanwhile, make the glaze. Combine the sugar and water in a small saucepan over medium heat. Stir until the sugar has dissolved and simmer for 1 minute. 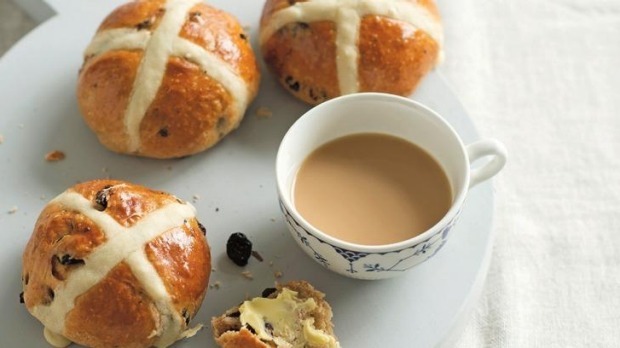 Transfer the hot cross buns to a wire rack and brush the tops with the glaze. Serve warm, spread with butter. Dried cherries are available at selected supermarkets, delicatessens, grocery shops and speciality food stores. You can replace them with good-quality dried cranberries. in an airtight container. Thaw at room temperature. This is a great stand-by recipe that's perfect to whip up at a moment's notice. It's particularly good for cake stalls and picnics, but the best thing about this cake is all you need for the mixing is a saucepan and a wooden spoon. 1. Preheat the oven to 170C or 150C fan-forced. Grease a 9cm x 19cm (base measurement) loaf tin and line the base and long sides with one piece of baking paper, allowing it to overhang the sides. 2. Place the sugar, butter and milk in a medium saucepan over medium heat. Stir until the butter just melts (be careful not to let the mixture get too hot). Remove from the heat. 3. Use a wooden spoon or balloon whisk to stir in the egg and pecans. Add the flour and stir until just combined. 4. Pour the mixture into the prepared tin and smooth the surface with the back of a spoon. Bake for 35 minutes or until a skewer inserted in the centre comes out clean. Leave to stand for five minutes before turning out onto a wire rack to cool completely. 5. To make the caramel icing, sift the icing sugar into a medium bowl. Mix the golden syrup and water in a small bowl until combined. Add to the icing sugar and use a wooden spoon to stir until smooth and well combined. Cover and set aside until needed. 6. Spread the top of the cooled cake with the icing, allowing it to drizzle down the sides. Decorate with the whole pecans and drizzle with the golden syrup. Serve cut into slices. This cake will keep in an airtight container in a cool place (but not in the fridge) for up to two days. To freeze, wrap the un-iced cake well in plastic wrap and seal in an airtight container or freezer bag. Label and date and freeze for up to three months. Thaw at room temperature. 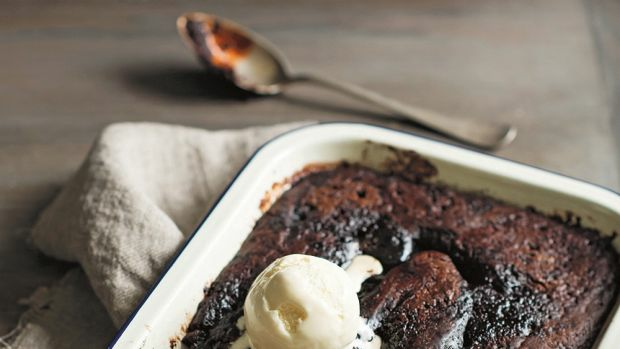 It has always fascinated me how a sprinkling of cocoa and sugar followed by some boiling water poured over a pudding batter can magically form a deliciously rich chocolate sauce underneath the pudding when baked. No easy way of explaining – just watch in awe and enjoy. 1. Preheat the oven to 170C or 150C fan-forced. Brush a 1.5-litre capacity ovenproof dish with the extra melted butter to grease. Place the dish on a baking tray lined with baking paper. 2. Sift together the flour and cocoa powder into a medium bowl. Add the sugar and stir to combine evenly. 3. Put the milk, melted butter and egg in a separate medium bowl and use a fork to whisk until well combined. Add to the flour mixture and use a wooden spoon to mix until smooth and well combined. Pour the batter into the greased dish and use the back of a metal spoon to smooth the surface. 4. To make the chocolate sauce, combine the sugar and cocoa powder. Sprinkle evenly over the surface of the batter in the dish. Gradually and carefully pour the boiling water evenly over the sugar and cocoa. 5. Bake in the preheated oven for 30 to 35 minutes or until a cake-like topping forms over the top of a chocolate sauce. If you insert a skewer halfway down in the centre of the pudding it will come out clean when ready. 6. Remove the pudding from the oven and leave to stand for five minutes to settle before sprinkling with icing sugar, if desired. Serve with ice-cream or cream. These are edited recipes from BakeClass by Anneka Manning, photographer Alan Benson (Murdoch Books), RRP $45.